Staying in a lavish and homely cottage in the Isle of Wight is a wonderfully luxurious treat, and makes for a great holiday for you and your family, friends and loved ones. With plenty of country cottages dotted around the island, either facing the sea or buried deeper into the forests, there is something for everyone, including those with a fixed BBQ. Having a BBQ whilst on a self-catering holiday in the Isle of Wight is a great way of gathering everyone around in the garden with the sun streaming down on you, and making a little event or party celebration out of it. 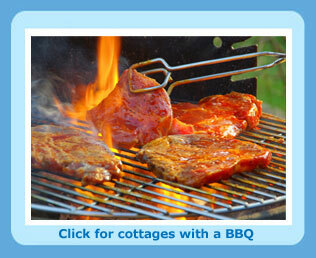 We have plenty of Isle of Wight cottages available with a fixed BBQ to make your break all the more exciting. The Isle of Wight is a haven for those who love to explore and to surround themselves with nature and history, with incredible castles, miles of coastline and plenty of golf courses and vineyards to discover, but no holiday is complete without sampling some delicious food over the course of your break. During a self-catering cottage holiday you are likely to eat out a few times, whether at top restaurants, quirky cafes or comfy country pubs, but cooking up a BBQ in the garden of your holiday cottage is a great way to spend lunch time with all of the family and friends, sun and music, whilst sampling succulent sausages, burgers and salads without leaving the grounds of your accommodation! If your Isle of Wight cottage does not come with an in-built BBQ in the garden of your lodgings, then do not worry as there are plenty of barbecue areas on the island as well as eateries where the cooking will all be done for you! Fort Victoria Beach has three purpose-made BBQs for small groups or families to use, where you can blend the mouth-watering aromas with the incredibly fresh sea air. If you are bored of doing all the cooking yourself then the beachside restaurant of Driftwood Beach Bar ‘n’ Grill, Sandown is a great place to try delicious barbecued steaks and succulent seafood, cooked to perfection whilst you sink your toes into the sand. Cottage holidays in the Isle of Wight mix together gorgeous landscapes with exciting activities and blissful surroundings, making it the perfect place to escape hectic life. Having a fixed BBQ in the garden of your hired cottage is a great way to make an event out of tasty food while having that homely atmosphere, and we have plenty of these cottages available for you and your loved ones. It is almost possible to smell the aroma of sizzling sausage and burgers on your own barbecue in the garden of you holidayr cottage. The BBQ is provided, all you need to do is to buy the meat, salad and drinks and have a relaxing time cooking outside where all the family can take their turn. No one worries about the mess or having to cook where a barbecue is concerned. Suddenly all the males in a group start competing to be chief cook. Ladies, sit back and enjoy the meal!